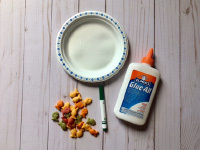 This paper plate goldfish bowl craft is VERY simple, yet so much fun to make! This craft requires Goldfish crackers. The best part is that kids can snack on them while they work. Have children paint their paper plate blue to represent a goldfish bowl. If you don’t have time to wait for the paper plates to dry, you could simply use blue paper plates. Use the green marker to draw seaweed on the bottom of the goldfish bowl. Add a few drops of glue on the plate and stick a Goldfish cracker on each dot. Keep the plates flat until they are dry. 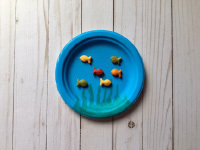 My little guys loved making these paper plate goldfish bowls. What’s more, they look super cute hanging on a wall or bulletin board.